Making the Super Mario Bros. star blanket has given me personal proof of the extreme popularity of making crafts for a niche obsession like video games. So when I decided to take my crochet skillz to the next level by designing a brand new pattern, I went to K for ideas. His request? 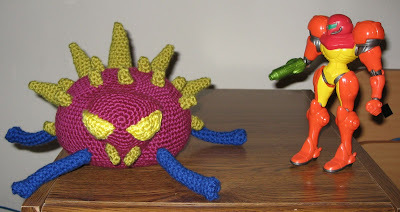 A zoomer creature from the original Metroid video game. This proved to be a little more difficult than planned because, while the zoomer has gone through many revisions throughout the series, he wanted to model it after the iconic 2D pixelated version from his childhood. You can download the free pattern I designed here from Ravelry. Registration may take 2-3 days, but it's totally worth it! Too fun! He's so cute, in a eat you face sort of way. Now I just have to learn how to crochet, lol! All content copyright © 2008-2019 A Gamer's Wife. Powered by Blogger.